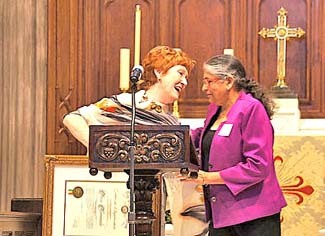 Paru Kammula was the star of the show at a recent reunion luncheon at St. James’ School. The event brought together alumni students and their families past and present to honor Kammula for her more than 35 years of service to the school. Also in attendance were former heads of school Fr. Chuck Rowins and Andrew Wooden, along with current leader, Debbie David. HEAD OF SCHOOL Debbie David presented a proclamation to longtime teacher Paru Kammula a a reunion luncheon. Her children were students at St. James’ when Kammula was asked by the kindergarten teacher to be her assistant. “I was kind of reluctant… I wasn’t sure I could deal with 20 little ones every day,” Kammula recalled with a laugh. Upon the teacher’s retirement, she was hired as kindergarten teacher, and later was also named director of admissions. When Kammula realized that her assistant was ready to lead the kindergarten class, “I moved to first grade,” where she has taught ever since. At the reunion luncheon, Elisha Riggs Hall, who along with five of her siblings attended St. James’, spoke of the special place the school has held in her heart. “When it came time for my daughter, Ella, to apply for kindergarten, I wanted for her to have what I had experienced growing up at St. James’… the feeling of a sweet, small school in the big city, the incredible connection I felt 30 years later.